Jeremy Scott shows off his 'wild side' by giving Magnum a Moschino makeover. Jeremy Scott gave Magnum a Moschino makeover. 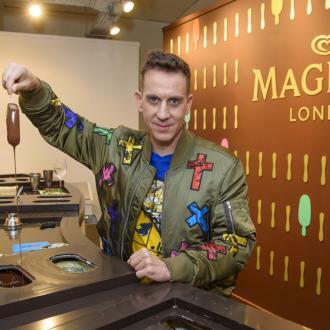 The 41-year-old fashion designer put his own stamp on the new look 2017 Magnum Pleasure store in London's Seven Dials this week, when he hosted an evening of indulgences, showcasing his bold, beautiful and colourful signature-Moschino look alongside Magnum ice creams. In celebration of the daring partnership, designed to celebrate Magnum Double, which encourages people to embrace their wild side and live the Magnum 'Dare to go Double' attitude, Scott also created a stunning collection of Magnum x Moschino luxury tote bags and a film, which was screened at Cannes. Speaking about his wild work, Jeremy said: ''The collaboration with Magnum, from designing to directing the film has been beyond fun for me. Working with Cara [Delevingne] was amazing, and being bold with fashion is something I try to bring to life in my work every day. Jeremy was joined on the night by former The Saturday's singer Vanessa White, 'Made In Chelsea's Oliver Proudlock and model Neelam Gill. Guests danced the night away to tunes spun by DJ Jodie Harsh and enjoyed a freshly dipped Magnum Double ice cream from the iconic Magnum Dipping Bar, where people can create their own totally unique ice cream. It has two delicious layers of chocolate and an indulgent layer of sauce, finished with a host of mouthwatering and enticing toppings. The Magnum x Moschino luxury tote bags are on display at the Magnum London Pleasure Store and are available to buy now at Moschino.com whilst stocks last. Meanwhile, the Magnum Pleasure Store will be open throughout the summer, with visitors able to design their very own Magnum ice cream, dipped in a choice of deliciously indulgent chocolate and choosing from a selection of tempting toppings including Black Lava Sea Salt and Blackberry Crumble, all from £5.50.